Looking for private in-home or in-studio Trombone lessons? Our Galena Park teachers are ready to get you started. Find your teacher today! I am a classically trained trombone player with experience playing jazz and pop styles. I can work with you to take your musicality to the next level regardless of your current abilities. Hi! I'm a warm and positive educator with years of experience helping students in music, math, and social studies. I have six years of public school teaching and private lesson experience in New Jersey, and I have recently relocated to the Austin metropolitan area. I am excited to help people further their knowledge and skills in areas they have a unique interest or area where they feel the need to improve. It would be my pleasure to meet with you at your home, host you at my place, or work over the internet. Great first lesson. Really tailored it to the student and her leaning goals. Jennings had a terrific first lesson! With a Bachelor's in Music Education and 12 years of study in Low Brass and Band, Jonathan is able to customize each lesson to the individual student's needs and goals in order to optimize enjoyment and results. Both solo and ensemble skills can be developed under Jonathan's study for trombone players. Students can be expected to play not just repertoire provided from their school but also assignments given by me. I enjoy teaching to better my Students musicianship not just to get in to region band or get Superior ratings at solo and ensemble. Bettering ones musicianship will almost certainly lead to these things however. I am a college student working towards my music education degree. Helping students achieve their musical goals has always been extremely important to me. When I teach I prefer to focus on expanding a Student's musical ability rather than focus on a specific piece, however if there is a piece a student wants to learn I will surely be very willing to help. I have been playing trombone, and more specifically, bass trombone, for over 20 years. I have studied trombone at New Mexico State University with Dr. Allan Kaplan, and at CalArts with James Miller of the LA Philharmonic. I have played, performed and recorded professionally with choirs, theater productions, jazz bands, marching and concert bands, symphony orchestras, small ensembles, and brass bands all over the world. I work to make my lessons enjoyable AND engaging. I will spend time with you on fundamentals such as key and scale studies, tuning, functional harmony, breathing studies, arpeggios, mouthpiece studies, rhythm and counting exercises all the way into more difficult materials such as extending your range, melodic and improvisation skills, single- and double-valve studies, and even into extended techniques, such as multiphonics, split tones, circular breathing, quarter tonal methods and more. 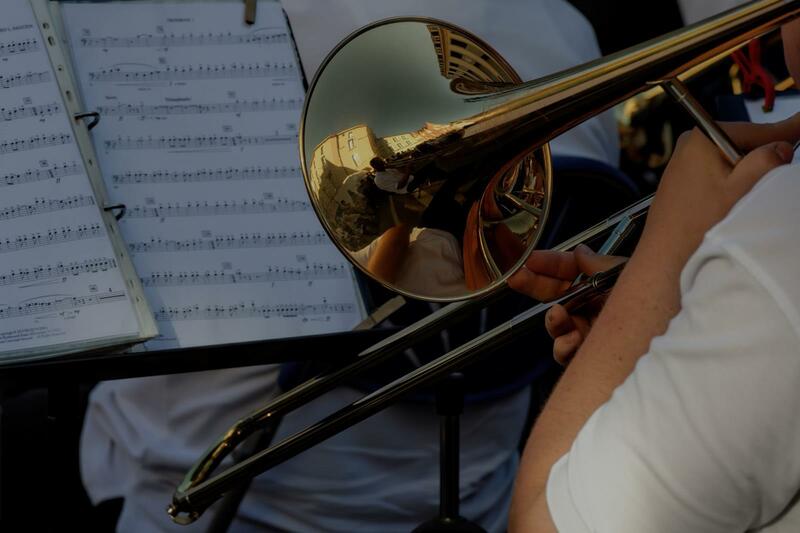 Are you struggling to start playing with trombone? do you need some assistance with a specific passage in a solo piece? I can help get you there! I have over 18 years of playing experience on the trombone and currently play with a professional orchestra in Ohio. I am also a public school teacher currently in my fourth year and absolutely loving my job! I am excited and looking forward to working with you in the near future! Hello and thank you for considering me as your trombone teacher! My name is Brian and I graduated from the University of Akron in 2014 with a bachelor's in music education. Obviously, I play the trombone and love every minute of it. In the past, I was a finalist in a concerto competition, 1st place local in the Tuesday musical scholarship competition and won an international competition playing in a trombone quintet with rhythm section. I come with a lot of experience and love working with people to share the joy of learning this magical instrument! Want to play your favorite songs? Want to write your own songs? I'm your guy! All ages welcome. I will customize your lessons to fit your goals and needs. When teaching total beginners, I like to start with an appropriate method book in conjunction with basic arrangements of popular songs that the student can relate to. We use those resources as a vehicle to a strong foundation. And then gradually introducing the student to new genres that may not be as exciting to them. I also spend a great deal of time discussing the importance of breath. I will often incorporate Breathing Gym exercises into our session. I encourage my students of all skill levels to perform publicly whether through competitions, recitals, or paid gigs. Students enjoy showing off what they’ve worked hard to accomplish! nd Walden University. I now teach music to young learners, and am currently helping to prepare students as they audition for admission into various college music programs across the country.